Twisted Metal: Head On is Sony's latest game to hit the PSP that is basically a rehash of the original PSOne title with a few new twists. The game itself is basically a blend of elements from Twisted Metal Black and Twisted Metal 2 that basically allows the gamer to play a variety of different characters who must drive around an arenas and cities, collecting weapons of mass destruction in order to eliminate their opposition. 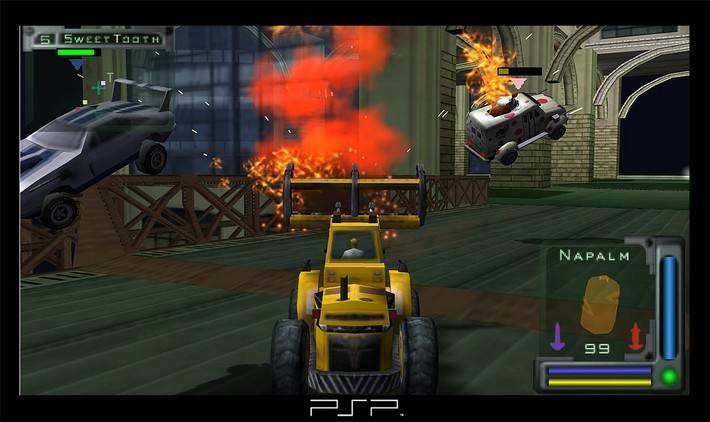 The of Gameplay Twisted Metal: Head On is varied and diverse that includes a story mode, challenge mode, endurance mode and also a multiplayer mode. The main crust of the game is the story mode that basically takes your character through a sequence of stages, throws in a few boss fights and neat little real-time cutscenes and finishes off with a big boss battle and an animated, character-specific ending. 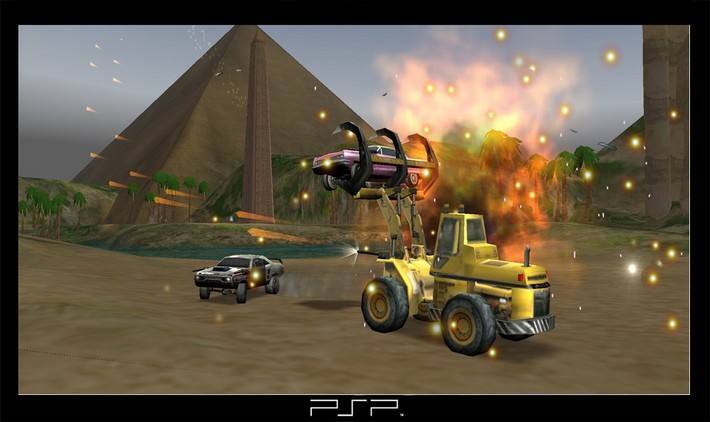 The control system on the PSP is rather intuitive and you basically drive around massive gaming environments and using your car and your weapons to basically ensure that you are victorious. Nothing is more satisfying than racing around the city when your on low health and somehow managing to dispose of all your opponents before you get hit by missiles and gunfire. The multiplayer mode of Twisted Metal: Head On features Wifi modes for not only LAN play but also internet play and allows for up to 5-players for some great multiplayer excitement. Graphically, Twisted Metal: Head-On is a rather impressive looking game on the PSP that contains huge detailed environments from real-world locations such as Paris and Hollywood and also other strange and bizarre locations to help immerse the player into this dark and twisted world. The title also features some great prerendered cinemas to help move the story along nicely. The designers have done a wonderful job at creating huge gaming environments that doesn't suffer from popups and fade-ins with an extraordinary amount of attention to detail such as people walking the streets, traffic lights and also other vehicles. The true star of the title are the cars themselves that contain some great texture details and car models. Best of all, Twisted Metal: Head On maintains a respectable framerate without any slowdown whatsoever. The musical score of Twisted Metal: Head On features your traditional hard rock soundtrack that not only contains instrumentals but also vocals that is actually effects by which region you are "racing" in. There is also a plethora of destructive sound effects such as the sounds of metal upon metal, the whistles of rockets and also the sounds of cars blowing up. In conclusion, Twisted Metal: Head On is a great game for other PSP and Sony have really out done themselves with this title that features enjoyable gameplay, brilliant graphics and a thumping soundtrack to keep you entertained for hours on end. Once you've finished the story mode aspect of the title, get ready for some great online play, provided you have a wireless router and broadband connection but it's the 21st century, so there should be not excuse! Highly Recommended!